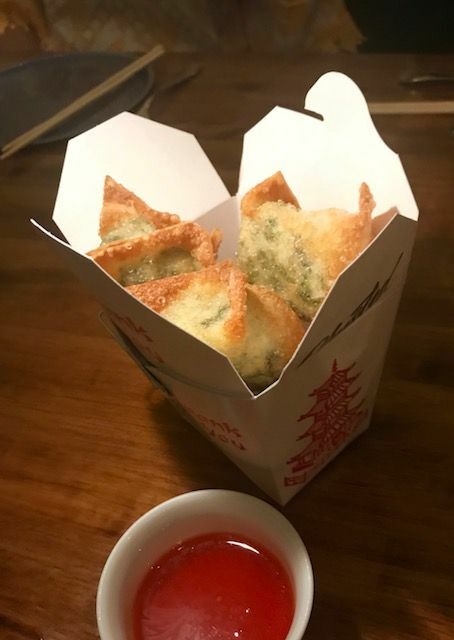 Deep fried crab and kale Rangoon dumplings come piled in a Chinese carryout carton to eat with chopsticks. We are making our way toward Brooklyn, Ryan playing dodgem on the West Side Highway. We’re on a bridge, and, soon enough, driving through Prospect Heights. My friend Lauren reserved tonight’s table at Olmsted on her last visit, so obviously she likes it and thinks I will too. That’s all I know. Clearly I’ve not been paying much mind to Brooklyn eats. There’s a short counter with seats to eat and a full view of the activity in the kitchen. I missed Pete Wells dropping two stars here in 2016. 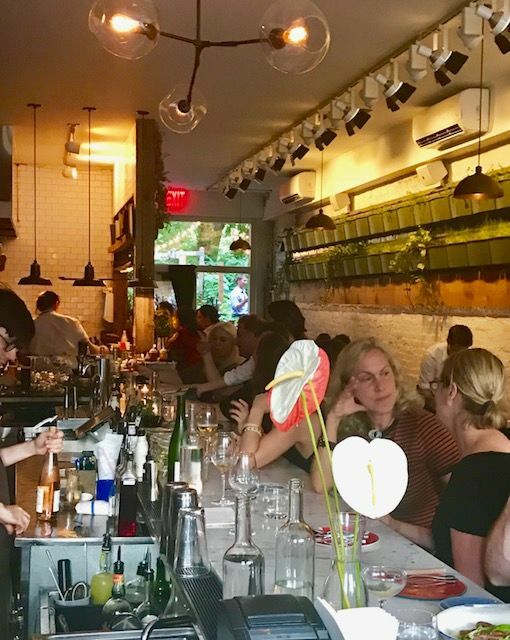 I didn’t notice Eater’s critic Bill Addison calling it the “current sweetheart of Brooklyn dining.” Apparently, it was a finalist for best new restaurant in the 2017 James Beard Awards. I missed that too. Named for the Prospect Park designer, Olmsted sets butcher block tables against a living wall of greenery. Of course I’m unaware that chef Greg Baxtrom matriculated through Mugaritz, Per Se and Blue Hill at Stone Barns, and that he and his farmer partner, Ian Rothman, planted the working garden here. I have nothing against Brooklyn. I just rarely go there unless someone offers to drive. Amazingly, there’s a parking space three doors away. 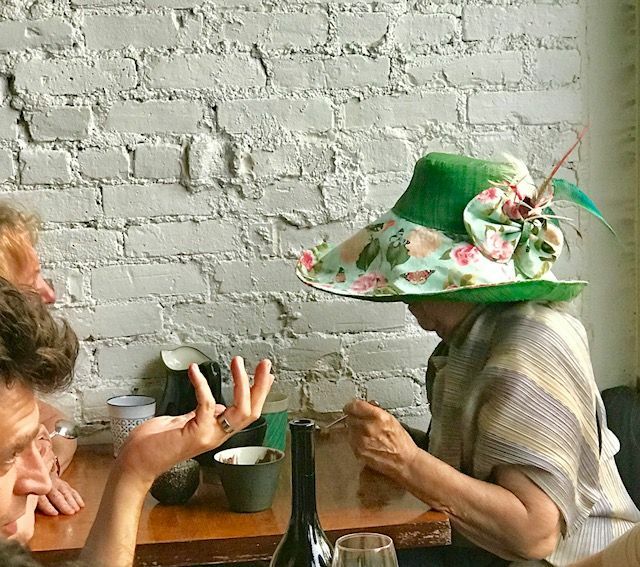 We are delighted to see a dinner guest wearing a garden party hat. Since my pal got her table through a publicist, it’s waiting for us. We’re not obliged like walk-ins to simmer out back in the heat over snacks and a glass of wine. I can see the plant wall above our heads, but my back is to the garden. 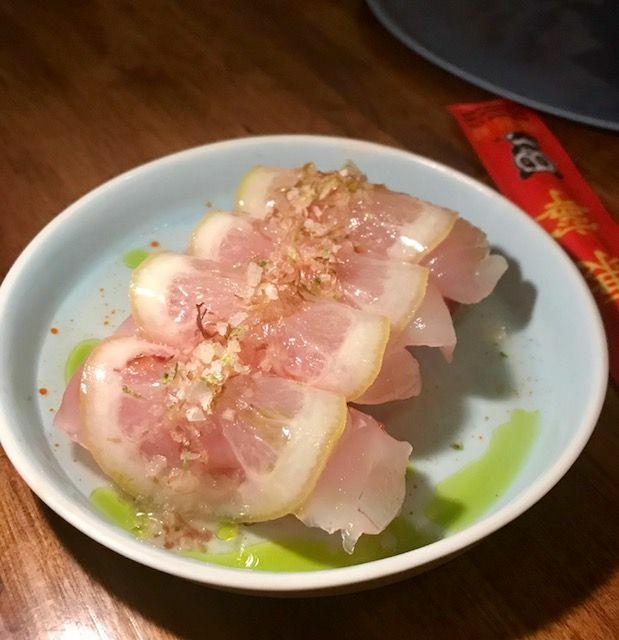 Though I didn’t come anticipating quirky and original, I get the drift as soon as I notice the menu’s lead offering, watermelon sushi. And “watermelon sushi” doesn’t reveal the half of it. There are thin slices of Long Island fluke under the sheer rounds of lemon confit wrapped around fingers of melon. The fleur de sel glaze ignites herb oil infused with green clippings from the garden. There’s one for each of us, tangy and delicious. 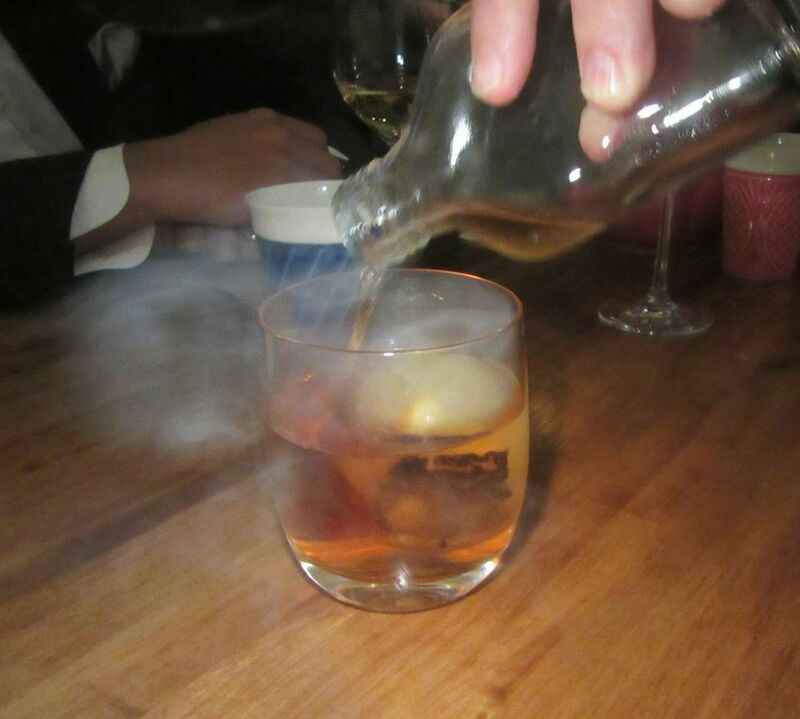 Our server pours my burnt orange cocktail into a glass of smoke. 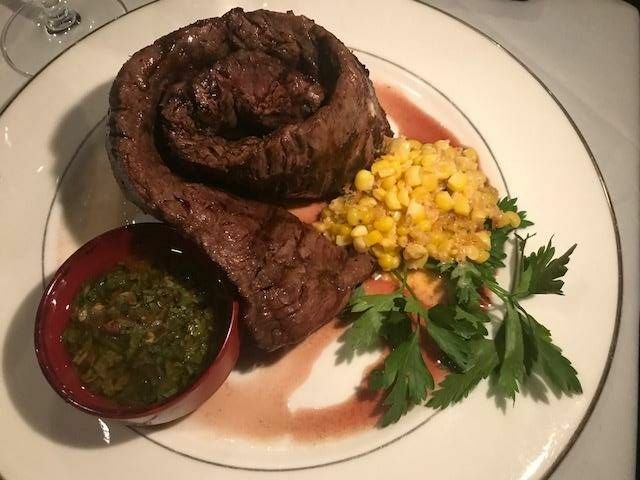 The menu isn’t just brief – fourteen items – it’s small too, 6 inches by 8 ½. Snacks and small plates, $12 to $16, larger plates $20 to $24. While I sip my Burnt Orange cocktail and we debate what to order, it occurs to me I want to taste almost everything. My companions are game. 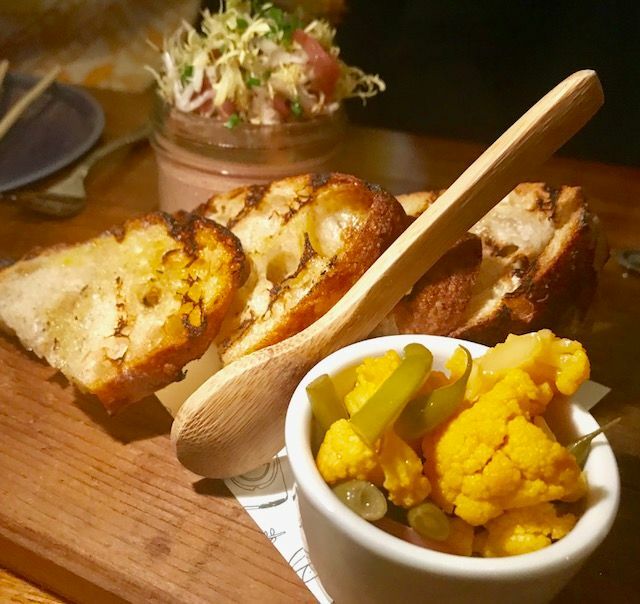 Duck liver mousse topped with a hedge of salad is served with oily toast and pickled cauliflower. 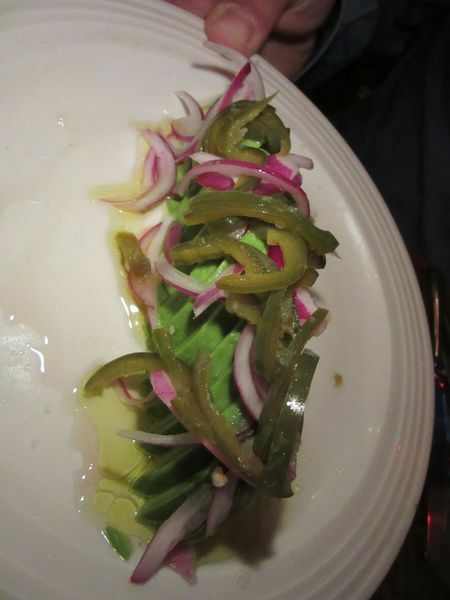 There is a bristly hedge of raw vegetables atop the Mason jar of silken duck liver mousse. I mix a spoonful of each together atop a wedge of grilled toast. Cauliflower pickles are piled into a cup alongside, a punctuation. Small tastes when shared by four. 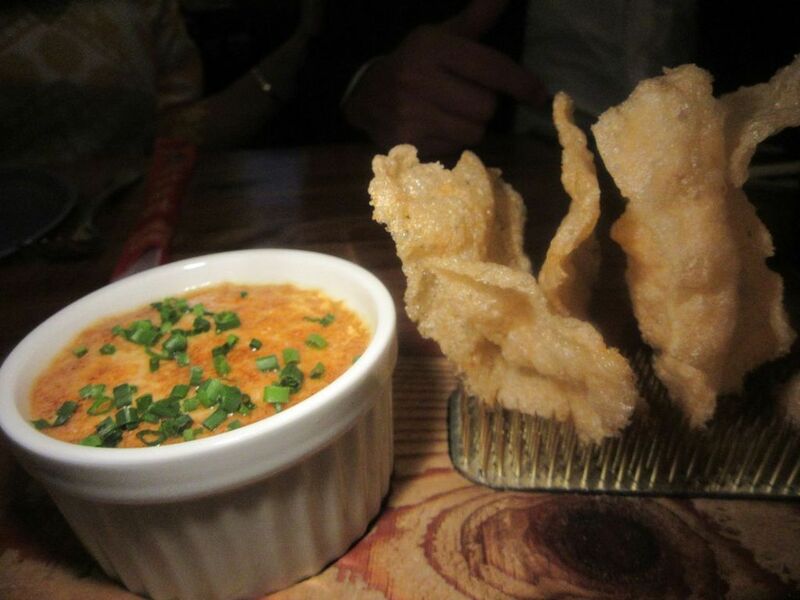 Shrimp chips are meant to scoop up the custardy lobster thermidor in a small ramekin. A ramekin of custardy lobster thermidor is meant to be dipped up with blobby crisps. I’d like a spoon, please. Chopsticks come with the Chinese carryout carton of kale and crab Rangoon. I break off a chunk of crispy dumpling and drag it through the sweet-and-sour sauce. Olmsted’s Cobb salad is a pebbly toss with Bayley Hazen Blue cheese, watermelon radish and gooseberries. 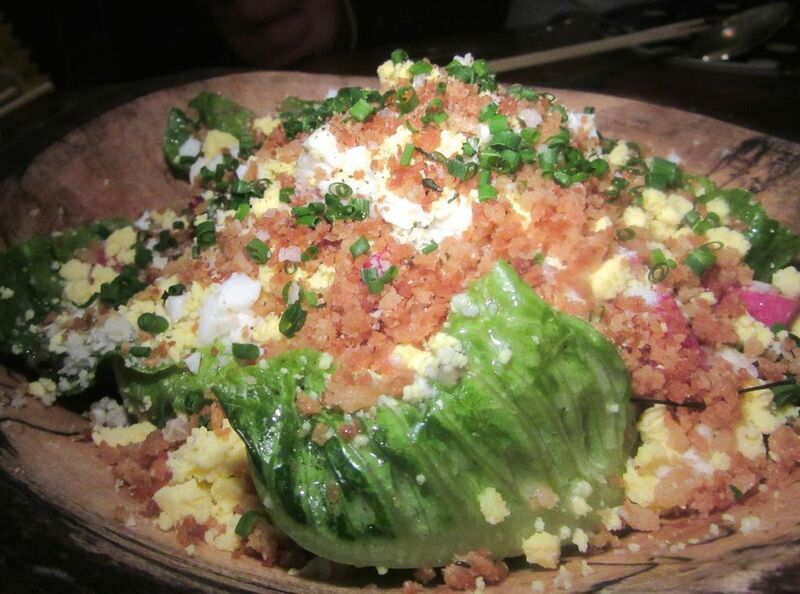 I have to ask for serving spoons again so we can scoop up mounds of chopped Cobb salad from its wooden bowl. It’s the house’s play on the classic, with Bayley Hazen Blue cheese, watermelon radish and gooseberries. 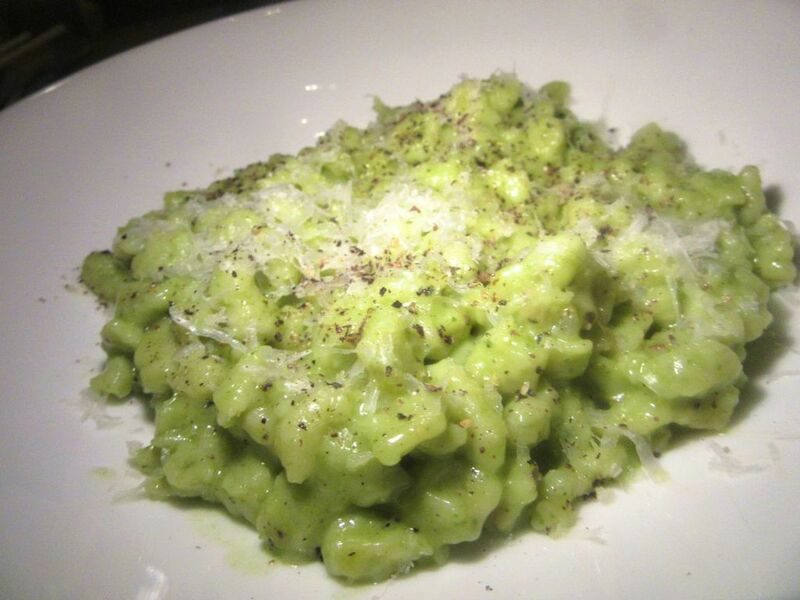 Green garlic, quark cheese and black pepper flavor the Garden spätzle cacio e pepe. Green garlic and quark cheese color and flavor the sticky splotch of “Garden Spätzle Cacio e Pepe.” Salty, and kicky from black pepper too. Olmsted’s carrot crepe with scattered pepitas looks like an edible bouquet, but tucked underneath are little neck clams. 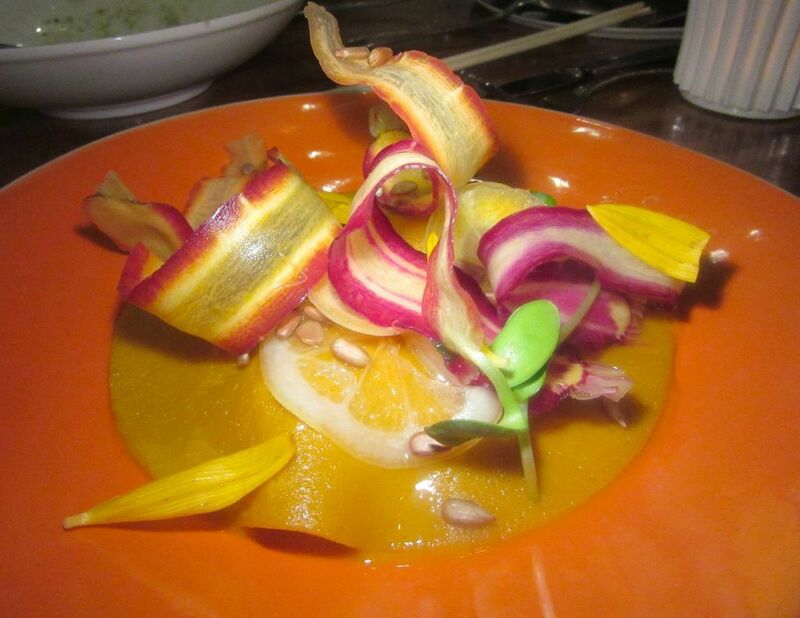 The carrot crepe, dotted with flower petals and pepitas, hides baby clams underneath. In between, I have time to marvel at the stamina of the expediter as she parcels out the plates from the cooks to the servers, garnishing as they flow by. At the last minute we decide we must have the tempura broccoli rabe with shiso hollandaise. 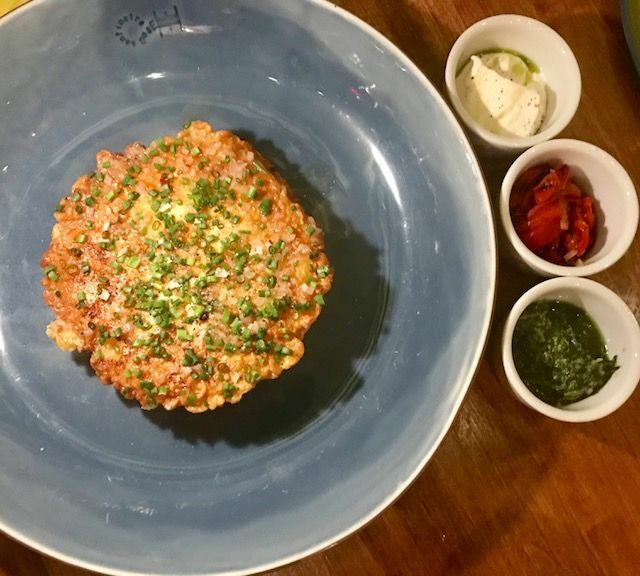 The heirloom tomato schnitzel is ringed with little ramekins of ricotta, bagna cauda and piperade. 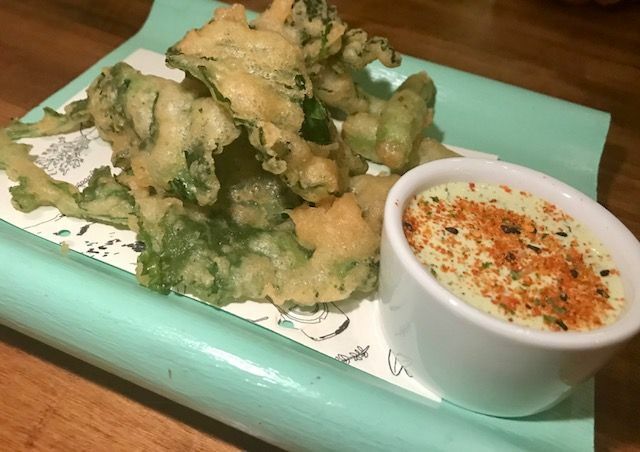 Belatedly, we decide to add broccoli rabe tempura with shiso hollandaise. It comes along with the heirloom tomato schnitzel: a circlet of multicolored tomato quarters held together with ricotta and crumbs. The small shares are getting larger and, with pauses between, I’m getting fuller. 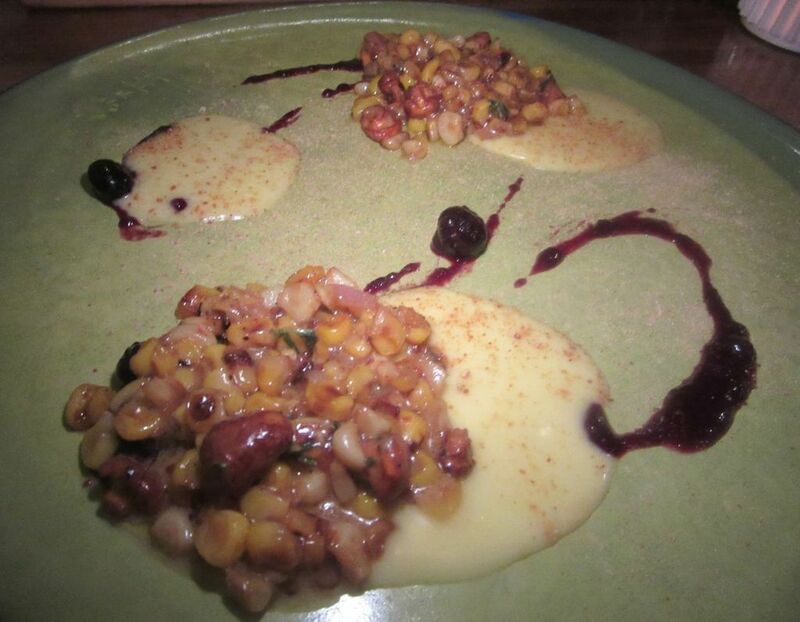 Spicy dry-rubbed scallops with grilled corn, chanterelles and blue berries are barely grilled. 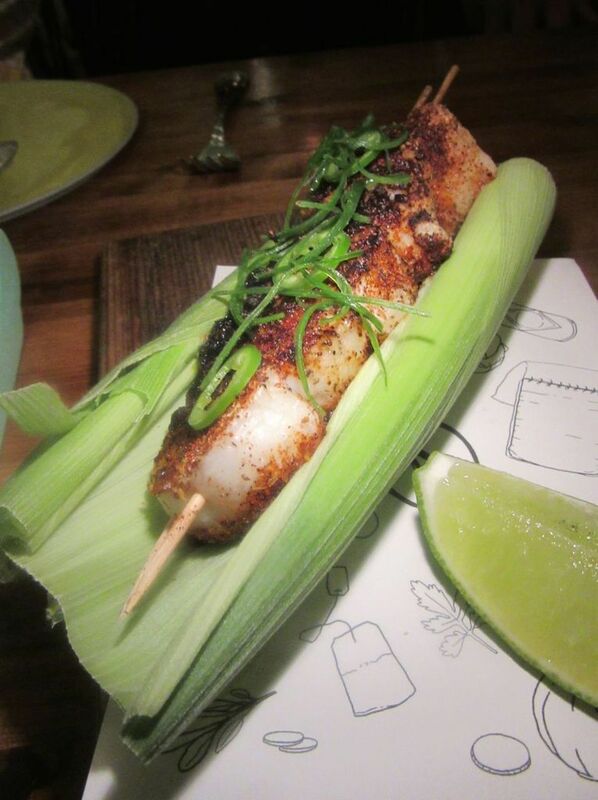 A quartet of grilled dry-rubbed scallops – barely gelled -- comes skewered in a corn husk with a side of grilled corn, chanterelles and blueberries. After another pause, our sever shaves truffles atop rare slices of roasted duck and grilled duck sausage with spring onion on one plate and delivers a garnish of corn and cherries on another. 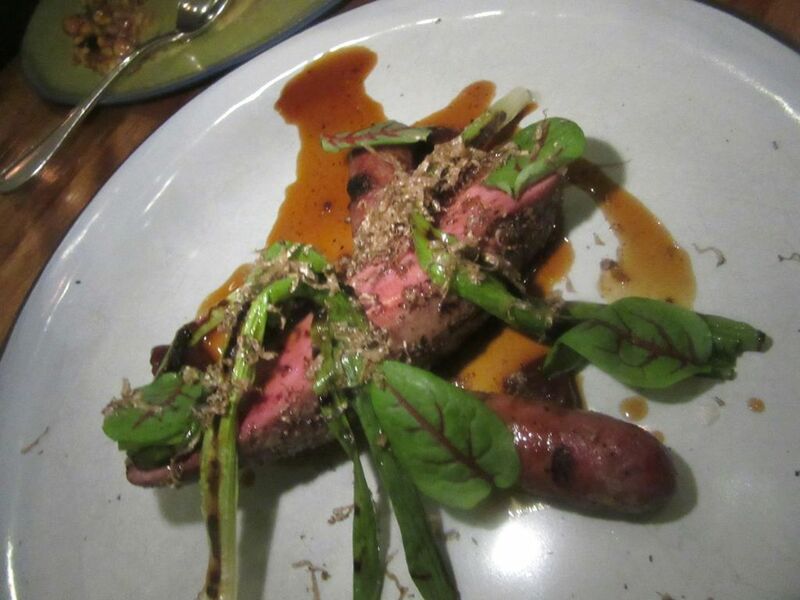 Roasted and grilled duck is meaty and rare, served with spring onions, cherries and truffles shaved on top. 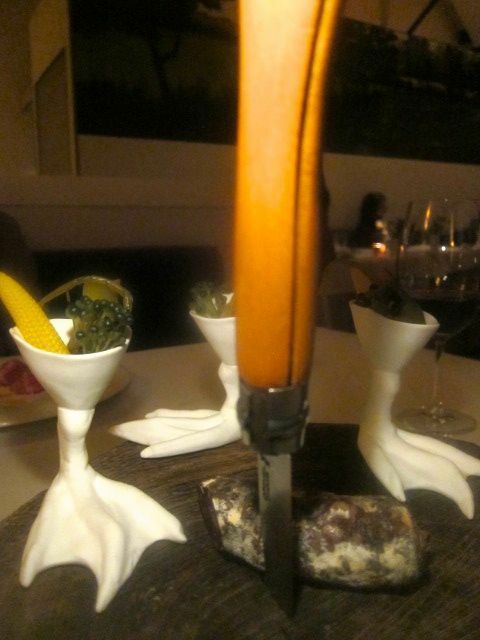 The duck and its fixings are delivered from the kitchen on a duo of dinner plates. We agree to share one dessert. The old school chocolate mousse is my choice, but I’m outvoted in favor of the frozen yogurt. I have to admit that seems sensible after such a tangle of tastes. It materializes as a drift of whipped cream studded with lavender flowers on a frozen wedge of dense and tangy yogurt. 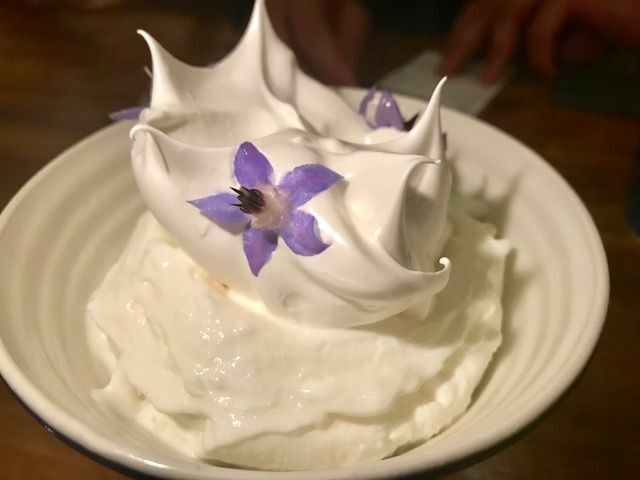 The frozen yogurt is steeped with lavender honey and sprinkled with lavender flowers. Olmsted is Chef Greg Baxtrom’s gift to Brooklyn. He might easily have found backers to open a small and exclusive restaurant to showcase his artful cooking. Instead he opened this one, small and crowded, offering affordable artistry. 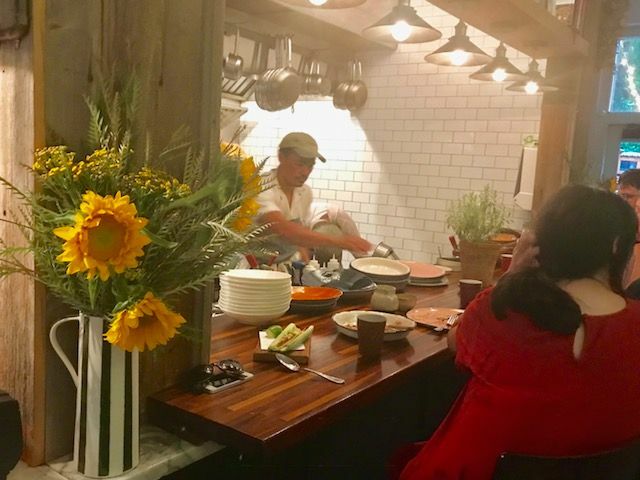 On our check, the restaurant promises to “donate five per cent of the profit for every meal eaten at Olmsted to Grow NYC to help New Yorkers eat better, garden, plant a tree, connect with nature and improve or city!” A year ago the partners were committed to opening another spot across the Avenue. I hope I won’t be the last to know what happens next. 659 Vanderbilt Avenue between Park Place and Prospect Place. 718 552 2610. Monday to Thursday 5:30 to 10 pm Friday and Saturday 11:30 to 2:30 pm, 5 to 10:30 pm. Sunday 11:30 am to 2:30 pm, 5 to 9:30 pm.